USD is acting strong against EUR due to better than expected US Initial Jobless Claims, however, the poor US PPI data stopped USD from growing higher. 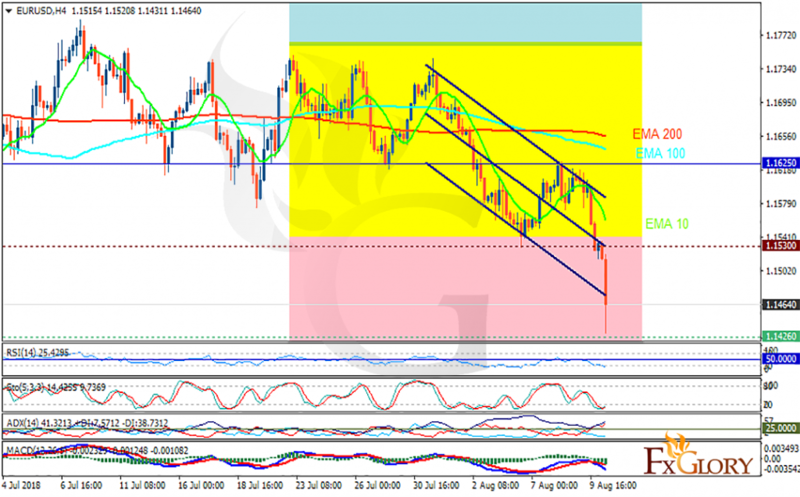 The support rests at 1.14260 with resistance at 1.15300 which both lines are below the weekly pivot point at 1.16250. The EMA of 10 is moving with bearish bias in the descendant channel and it is below the EMA of 100 and the EMA of 200. The RSI is moving in oversold area, the Stochastic is moving in low ranges and the MACD line is below the signal line in the negative territory. The ADX is showing strong sell signal. All indicators are showing downward pressure, the price may decline towards 1.13 area.